Throughout many periods Budapest played an important, often significant role in the history of the Carpathian Basin due to its geographic setting. Budapest is one of the towns in Europe where settlements have been found beginning from the Paleolithic age. The first town was built by the Romans on this area. Beside the civic town, the army camp of the legions an amphitheatre, industrial plants, sacred places and large cemeteries belonged to the town. Aquincum was one of the most important settlements of the province; it was one of the important chains in the set of settlements along the Danube. It also served as a center for the road system leading into the middle of the provinces. At the time of the reign of Traianus (106 AD) Aquincum was the capital of Pannonia center of the province named Inferior. Its first governor was Hadrianus who later became Emperor. Aquincum played an important leading role in the Province up to the 3rd century from the point of view of economics and military. The town of soldiers started developing fast after this period, and the civic town was given the title by Hadrianus: municipium (around) 124 and the title colonia by Septimus Severus (around) 194. After the economic reform of Diocletianus (294) Aquincum was separated into four parts and it became the center of Valeria Province. The history of Budapest and the settlement that stood on that area is known from the excavations, which have been performed for over a hundred years. The first excavation in Hungary can also be connected to Aquincum: at the end of the 18th century at the time of the reign of Mary Teresa István Schönvisner University teacher found the sauna of the military bath on Óbuda. The excavations started in 1881 and they still last today. First the amphitheatre was excavated and then the center of the old civic town. 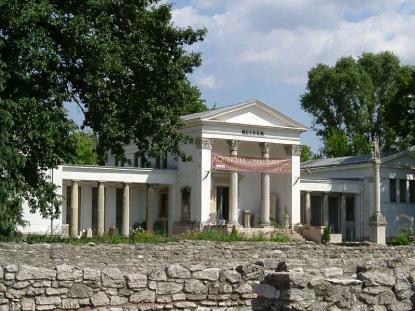 The Museum of Aquincum was founded to show the findings in 1894. The manager of the new museum became Bálint Kuzsinszky. WWI and the years following it were not in favor of the archeological works. Lajos Nagy became involved in the works only later, in the 1920's. He started paying attention to the suburbs of the civic town. Between WWI and WWII the military amphitheatre was dug out (today it is in the Nagyszombat Street) and the fortress known as Contra Aquincum. One of the major founding of the 50's was the Palace of the Residency through the unearthings lead by János Szilágyi. The state in which it was found made it necessary to create a rehabilitation program following the plans of Gyula Hajnóczi and Ágnes Vladár. It was executed by Klára Póczy in the 60's and 70's. The archeological park around the Museum of Aquincum is a reflection of this work.